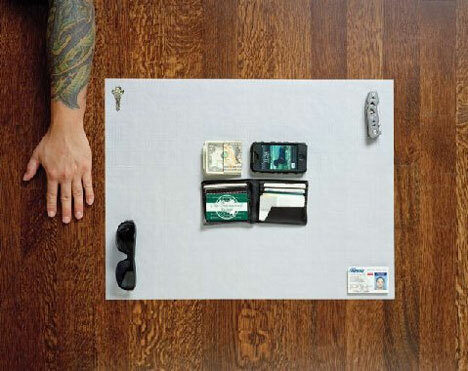 Would you empty your pockets for a perfect stranger? 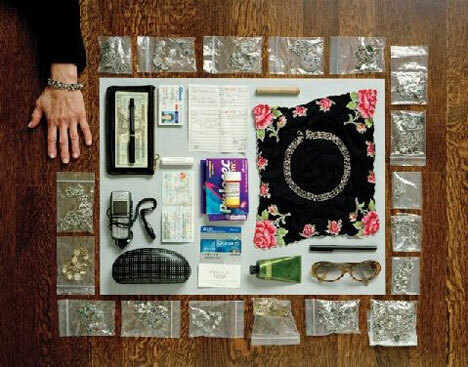 Would you let a friend go through the contents of your purse? 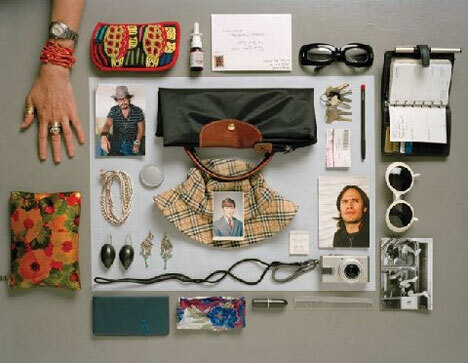 For most of us, the things we carry with us on a daily basis hold a certain, almost talisman-like power. They become our totems, our good luck charms, our little piece of home that goes everywhere with us. 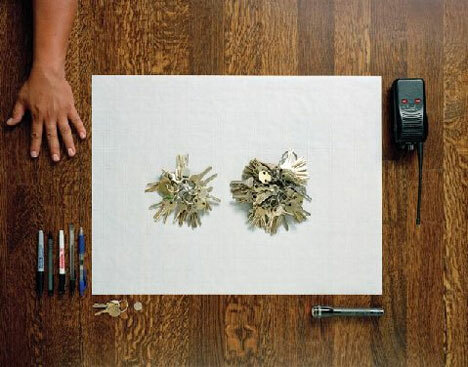 Artist Francois Robert knows the power of the everyday objects we all hold so dear, and he asked regular people – friends, family and even strangers – to empty their pockets and purses and let him photograph the contents. They had no prior knowledge of his plan, no time to stuff their pockets with items they might consider flattering. The collection is called “Contents,” and it’s as personal as you can get without seeing any more of a person than one hand. Taking this nugget to heart, Francois Robert asked 120 people to show him what they were carrying on the spot, with no advance warning about the subject of the photo shoot. 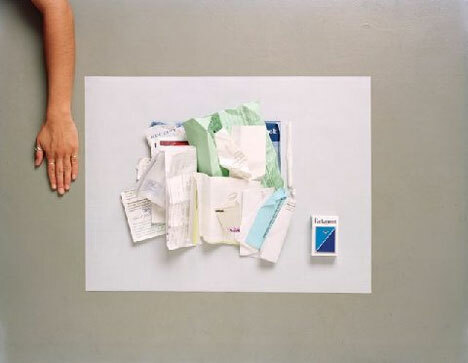 The artist did allow participants to take out anything they did not wish to have photographed, but surprisingly few opted to pick and choose what they would display in their photos. Only one prospective subject declined to participate in the project altogether. 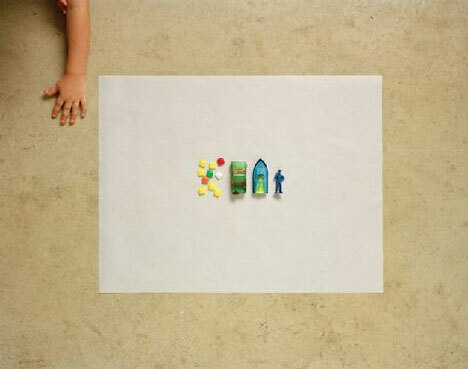 Mr. Robert is not the first artist to undertake a project like this. 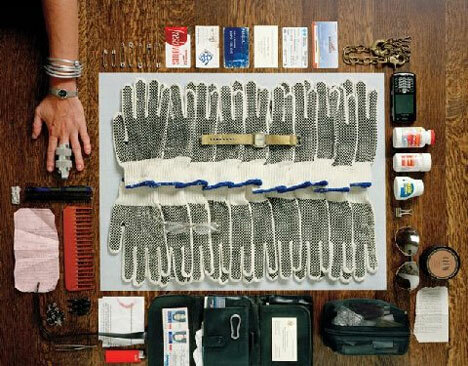 Others have photographed the contents of pockets and bags before. 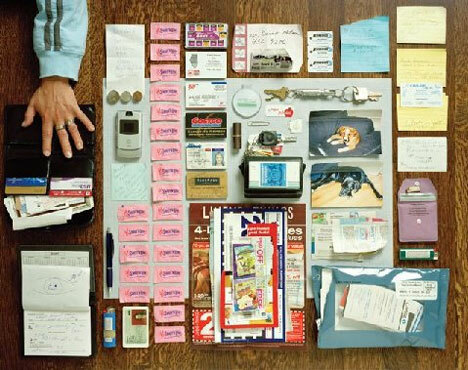 (Even Mr. Robert himself has been engaged in photographing pocket contents since 1978.) But it is the little differences that make “Contents” so compelling. 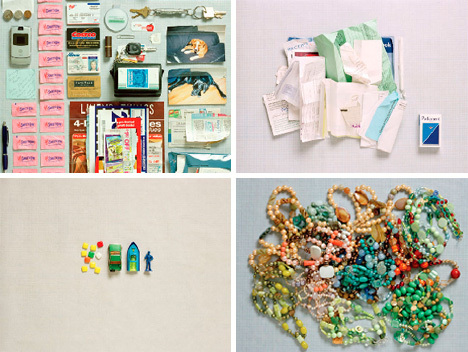 The photos never reveal the person behind each set of treasures; only one of their hands. The hand is usually (but not always) enough to tell you whether the owner is a man or a woman, a child or an adult. But the hands don’t reveal much more than that. 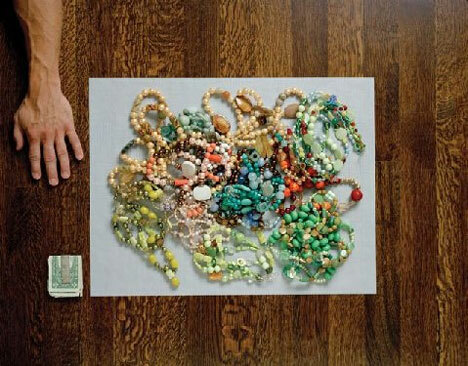 Explanations of the contents are left out, letting the viewer decide why any one person would carry piles of costume jewelry or ten pairs of work gloves. 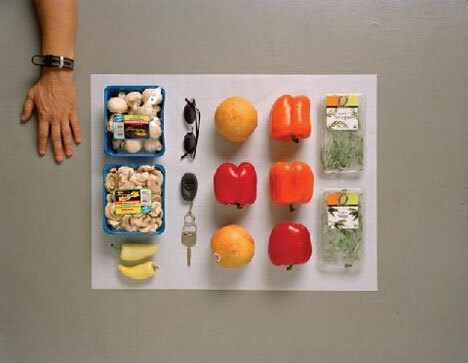 One of the most striking elements of this project is the way the contents are arranged. 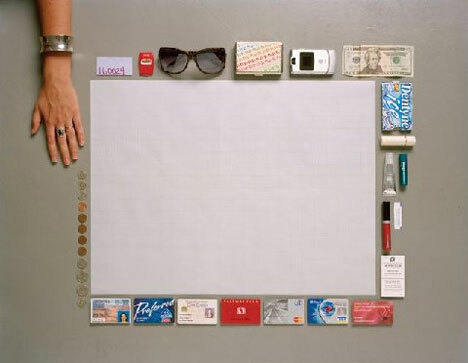 Rather than being haphazardly thrown onto a table, each person’s belongings are arranged carefully on a white canvas. 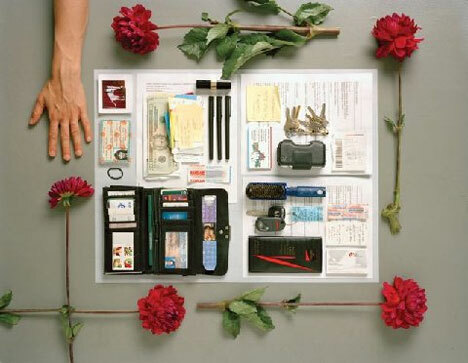 They are put in place by the photographer, who arranges them into orderly little piles, neat stacks and simple lines. 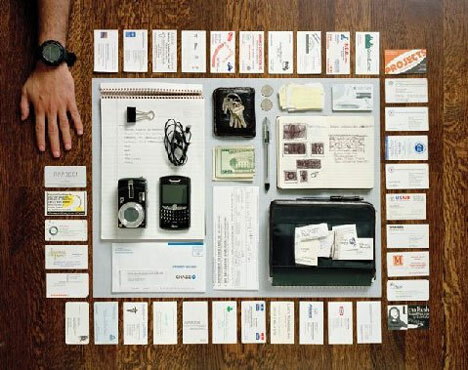 The organization doesn’t take away from the honesty of the project; rather, it helps to make visual sense out of the otherwise-messy grouping of random items. 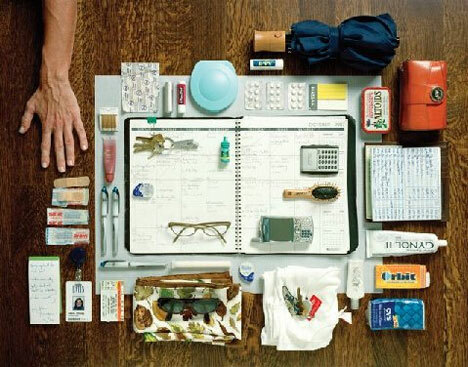 The seemingly insignificant things we all carry every day can actually say more about us as individuals than a traditional portrait ever could. After all, we have little control over our physical characteristics but we alone decide what goes in our pockets, purses, backpacks and briefcases. 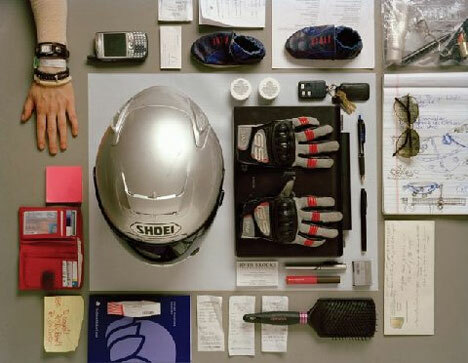 It would be impossible to get much more personal than laying bare the items which one considers important enough to keep close all day. 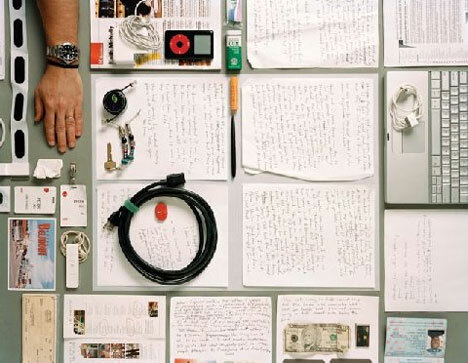 And that is why “Contents” is so powerful: the seemingly simple act of emptying out pockets and purses can speak volumes about a person that may ordinarily escape detection. 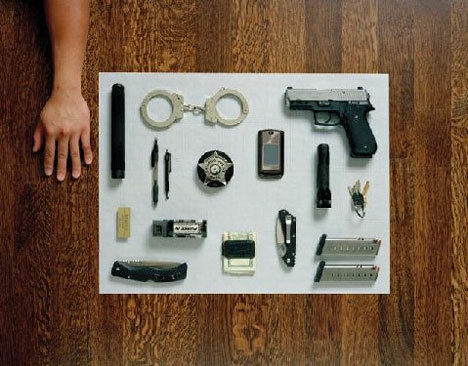 Many of the participants in Mr. Robert’s project felt that they had never been so exposed as when they laid bare the things they carry with them. 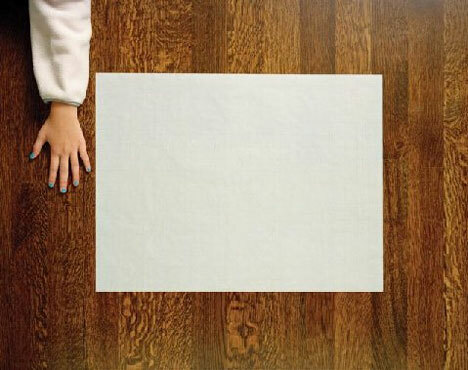 After all, these are the things we never expect anyone to see. They are our burdens, our treasures, our secret reminders, our past and our future. We could certainly survive without them, but they provide a sense of home away from home. 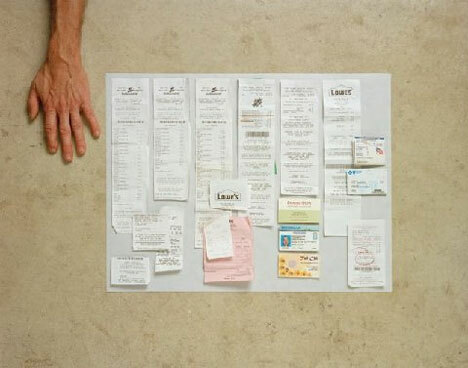 Since the subjects of these intimate portraits had no clue of what they would be showing to the photographer when they walked into his studio, they likely didn’t think to lighten their daily loads of keys, receipts, phones, notes, business cards…and even, in one person’s case, more than 20 packets of artificial sweetener. The project might be taken as a call to action: are there things in all our lives that we can stand to live without? Do we carry around unnecessary baggage, whether physical, emotional or mental? Do we hang on to things that we simply don’t need? Do we burden our back and our spirits holding onto objects, experiences and memories that would be better let go? Then again, one might choose to simply take this set of photographs at face value. They are more telling than portraits, more personal than candid snapshots, more intimate than a conversation. They are representations of each and every one of us in their own way. Maybe more than anything, Mr. Robert’s photos prove that there is a common thread running between each of us regardless of age, gender, profession or personality. We all balance our daily needs by carrying something with us. 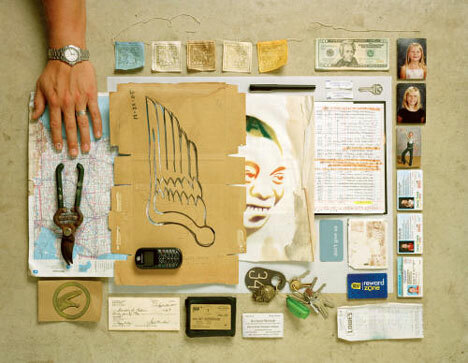 Whether that something is a reminder of home, a picture of a loved one, a store membership card, vegetables saved from a Dumpster, or, as was the case with the owner of one very small hand…nothing at all.